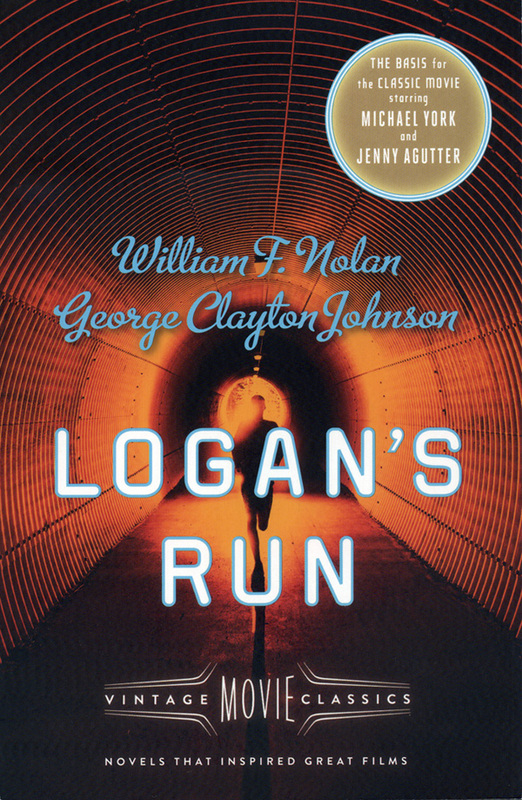 The new print and ebook edition of the original novel, “Logan’s Run,” by George Clayton Johnson and William F. Nolan, is now out, published by Vintage Books, a division of Penguin Random House. Check out the new line of Vintage Movie Classics right here. This is the bestselling dystopian novel that inspired the 1970s science-fiction classic starring Michael York, Jenny Agutter, and Richard Jordan. For many of you out there, enough said. It will instantly bring to mind crystal palm flowers flickering red. If that means nothing to you, then you’re in for a treat. Perhaps knowing that such works as “The Hunger Games” and the Divergent trilogy owe much to this novel with pique your interest. It is a beautiful new edition for longtime fans and newcomers alike. For the longest time, this title was essentially out of print, as far as a mass market printing was concerned. The original novel was a huge hit in its day, only to be magnified by its tie-in with the major motion picture. The novel was never forgotten and, in fact, its legend grew. Special edition print runs came out over the years and you could always find an old copy of the many editions that exist. For collectors, there are many iconic paperback editions to choose from. But the fact remained that the time had come for a new readily available edition and now we have it. I’ve been a big supporter of bringing out a new edition. You can read my review of the original novel and my call for a new edition right here. The forward is by Daniel H. Wilson, author of several books on possible dystopian futures, including Where’s My Jetpack?, Robogenesis, and the forthcoming, Quarantine Zone. Wilson provides just the right balance of looking back to his own childhood experience with Logan’s Run and observations on the novel’s enduring relevance. Wilson’s enthusiasm for his subject is infectious and adds a contemporary boost to a timeless classic. The novel, first published in 1967, paints a very compelling, and alarming, picture of a society overly dependent upon technology for all aspects of life. Youth has been conditioned to seek out distraction and pleasure over all else, including quality of life. That said, for anyone familiar with the movie, this is also one very entertaining story. The movie echoes the novel as it veers off into its own high level of kitsch. But no harm done. The movie remains a cult classic and an excellent gateway to the original novel. I have always held a fascination with how movies adapt novels so I am thrilled to discover Logan’s Run is part of a new line of books from Vintage Books. Vintage Movie Classics includes a wide variety titles like “Night of the Hunter,” the bestselling National Book Award-finalist that inspired Charles Laughton’s expressionist horror classic starring Robert Mitchum and Shelly Winters. Other available titles: The Bad Seed, The Bitter Tea of General Yen, Back Street, Alice Adams, Show Boat, and The Ghost and Mrs. Muir. This is truly astounding for the broad range and the opportunity to rediscover lost gems. You can find Logan’s Run over at Vintage Books right here and over at Amazon right here. Glad to hear of a new edition of this. It’s a strange and compelling movie for all that it’s goofy and I’m interested in how the story formed. It definitely strikes a chord with people. Quite a unique book as it is a wonderfully strange and ebullient love letter to pulp fiction as well as a compelling work of science fiction in its own right.